Wow. I'm still here. Really, I am. Tis the season to be hunkered down and happy. Which leads to a lot of absence in this place. I'm sure that will change come the new year. At least I truly hope that it will. *My mom showed up at my house a week ago for a whirlwind of decorating, gift-giving and also the handing down of several things that she's been storing from the old farmhouse we grew up in….sheep show boxes and fitting stands, bee hives, galvanized tubs, rubber feed pans, and an old writing desk. 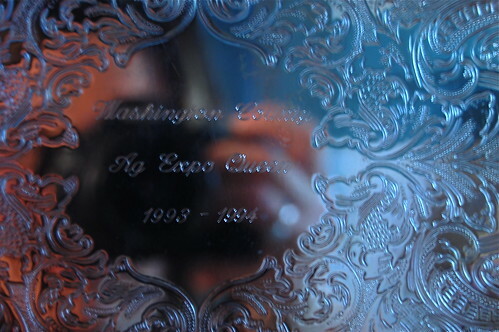 She also showed up with a bag containing this little silver tray, a prize from my "reign" as queen of the county fair. It's funny, but if left to my own 17 year-old opinions, I'm sure I would have thrown this out years ago. But I'm so glad it got squirreled away in my old bedroom closet. She brought it to me last week. And now, it feels so special. And it was the perfect thing for our tea at breakfast this morning. *Sickness has been making the rounds at our house the past several weeks. But I think it's safe to say we are all finally healthy but for a few lingering sniffles. Phew. That was a long stretch. * Mary and Birdy are like a little miniature "circle of life"….one is losing teeth as fast as the other is getting them in. *I have been knitting like crazy from this . two elf hats down, two to go. *I also have a project to block and ends to weave in for a shrug I made for birdy. My husband doesn't "get" the shrug…and I have to admit, while extremely cute, the jury is still out on its practicality for a baby. But his favorite thing to say to me is, "so that's half a sweater, that's half finished??" Yes. Yes it is. *My favorite background to knitting has been online episodes of Parenthood. Am I the only person who finds this show oddly intriguing and mildly addicting? *Yesterday was a sad day. I had to purchase my first box of store-bought eggs. The girls aren't laying enough now during the short winter days to keep us in eggs. 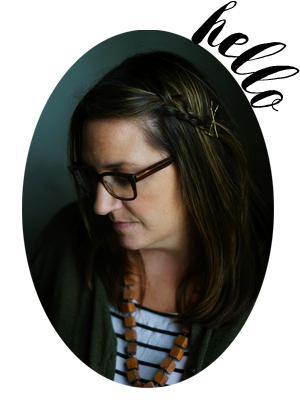 *A good post from gwen bell…what are we willing to put down in 2011 ? In the words of GK Chesterton (quoted in her article, and also a personal family favorite) "It is easy to be heavy, hard to be light." *this picture and this one. loving. 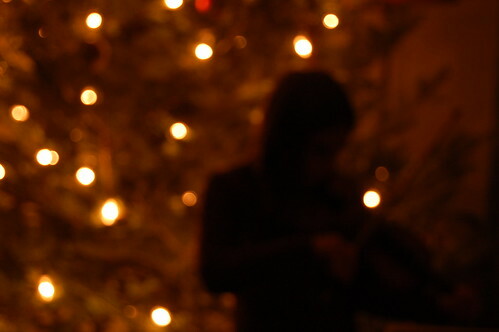 *the night we put up the Christmas tree, I sat in a chair in the living room and watched my children–one on violin, one on a guitar with only two strings, one on a wooden recorder. And I was struck. By how much I loved that moment. But also by the fact that this is them, making their memories. That blows me away some times. *the other night, as I was in bed with elizabeth, just before she fell asleep she asked me, "Is Christmas after bed time or is Christmas after college?" If I am not back in this space before the holidays, here is my Christmas wish to all of you for a warm, healthy, full, and happy holiday. let us know what you think of the baby shrug. It’s adorable but yes, I want to know if it’s practical too. Merry Christmas to you and you family! I also am a fan of Parenthood. I normally watch it on Hulu (since I am pg again and can’t stay up that late). Glad that you are all finally well again, my DS just had the flu this weekend and we are hoping that the rest of us stay healthy. (fingers crossed) Enjoy those memories being made and I love the quote from Eliizabeth! I have a journal to write those things down, but somehow they don’t all manage to get in there on their own. 😉 Happy knitting! I am hoping to sew 2 pairs of Pjs and one blankie before Saturday…we will see. i would really like to see a photo that goes with that tray. just sayin’.xoxo. Merry Christmas Molly – we’re in wind down mode too here. love Parenthood- my perfect indulgence right before bed. Merry Christmas to you, too, Molly. I’m struck by the witnessing of memory-making all the time lately — a wonderful thing. Yes! I love those moments. Merry Merry Christmas to you and your family, Molly!!! Have a very, very Merry Christmas!! Your blog never ceases to amaze me and I love stopping by daily!! Have a wonderful weekend and thanks so much for always making my day!!! Would love to know how the shrug works out – so very cute! Your writing is so beautiful and real. I always look forward to your posts. (Big fan of Parenthood, too.) Happy new year! Love the knitting! Happy New Year! Our ladies are on strike as well. Can’t wait until they start laying again soon. I LOVE parenthood! ONe of my favorite knitting shows as well!We have the cirlcle of teeth going on here too. Isn’t it funny?Yay for memory making. I love the kid thought up traditions! The best!Hope your holidays were wonderful. I love, love, love Parenthood. I look forward to it every week. I usually Tivo the episode and watch it in the afternoon the day after when no one’s home and i can savour it with a slice of cake and a cup of tea. That was last year. Now that my baby’s here (Her name is Elisabeth! ), i think my Parenthood ritual will have to change- perfect breastfeeding companion!